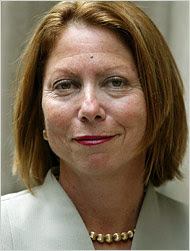 the nytpicker: Live-Blogging Jill Abramson: "What Would Happen If We Left It To Others To Do First-Hand Reporting?" Live-Blogging Jill Abramson: "What Would Happen If We Left It To Others To Do First-Hand Reporting?" Managing editor Jill Abramson has answered her first question in this week's web feature, "Talk To The Newsroom," and made a pointed contrast between television news organizations withdrawing reporters from Iraq -- citing last week's business-section story by Brian Stelter -- and the Times's continued presence there. Of course, this neglects the fact that Stelter's piece dealt primarily with network television's presence in Iraq, and reported that both the Times and Washington Post, along with AP and Reuters, still keep multiple reporters based in Baghdad. But that doesn't stop Abramson from crowing about the Times -- which, after all, is the essential purpose of the "Talk To The Newsroom" feature. The point of the question is to ask Abramson whether the Times would consider becoming a "curator" of the growing supply of online journalism content, as a means of saving money on reporters. "Is this a realistic prospect?" asks John Mihaljevic. That prompts Abramson to talk about the Times's recently-added "Times Extra" web feature that aggregates web information and blogs, and its previously-announced plan to add more expert commentary to the website. But Abramson can't resist a dig at the competition, by citing Stelter's story as evidence of the Times's superiority: "With other news gatherers retreating, what would happen if The Times left it to others to do the first-hand reporting?" Fortunately, as long as the Times continues to exist, we don't have to consider that terrifying prospect. If there's any doubt left about Abramson's exalted opinion of her employer, consider how she answers her own rhetorical question. "We view our work reporting the news around the world, from the China earthquake to the financial meltdown on Wall Street, as a public trust that contributes to an informed society," she says. "This will always be journalism's highest calling." Hmmm, that sounds to us like the workings of a pitch for a government bailout.